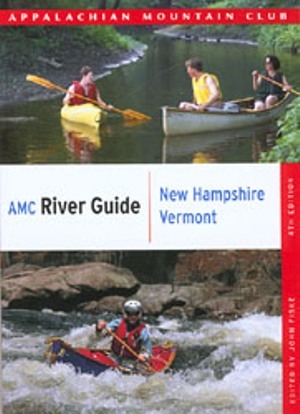 AMC River Guide - New Hampshire/Vermont, 4th Edition, 2007. Edited by John Fiske. The comprehensive AMC River Guides are indispensable for canoeists and kayakers. Each guide covers thousands of river miles, organized by watershed. Tables for each river section list difficulty, recommended water level and season, scenery, maps, portages and distances. Descriptive text provides essential info on road access, landmarks, cumulative mileages and the unique characteristics of each section.The NH/VT guide covers 2,500 miles on 130 VT and NH rivers. Watersheds include Memphremagog, Champlain, Hudson, Upper Connecticut, Merrimack, Piscataqua, Saco and Androscoggin. 328 pp, 5" X 7".